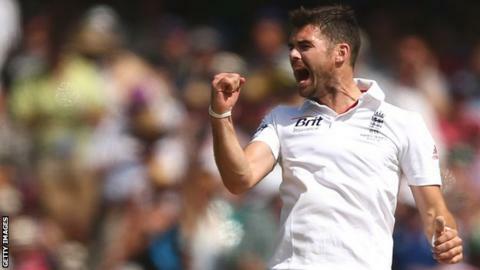 James Anderson plans to use the opening weeks of the Championship season to secure his place in England's summer Tests against India and Sri Lanka. The 31-year-old seamer took 5-54 on the first day of Lancashire's opening Division One match at Nottinghamshire. Anderson has not played competitively since the fifth Test of England's Ashes whitewash by Australia in January. "I see it as an opportunity to not only prove I'm worthy of a place in that team, but get into some form," he said. "Then if I do get picked, I'm in good form to get the England team back to where they should be." Can Jimmy break the record? A number of centrally-contracted England players will be involved in several matches for their counties during the first month of the season. England, who hope to name a new coach to succeed Andy Flower within the next month, play Scotland and Sri Lanka in limited-overs encounters before the first Test against Sri Lanka at Lord's on 12 June. Anderson, who was rested for the one-day series against Australia and did not feature in England's World Twenty20 campaign, admitted feeling "a bit of rustiness" on his return at Trent Bridge. The Burnley-born paceman, who has taken 343 wickets in 92 Tests, told BBC Radio Manchester: "I thought it went pretty well from a personal point of view, although I still thought there was a bit of rustiness in there. "It's been a nice couple of months for me, and a bit different doing a pre-season with Lancashire. I've not done that for a few years. "We went to Dubai on a pre-season tour but didn't get a huge amount of cricket in there for a number of reasons. It's good to get out and start competing in the Championship."